It’s no secret that little legs loves Doc McStuffins, she can spend hours recreating her favourite scenes with her stuffed toys. For those of you that haven’t heard, Dottie ‘Doc’ McStuffins, is a sweet six year old girl that can speak to toys. 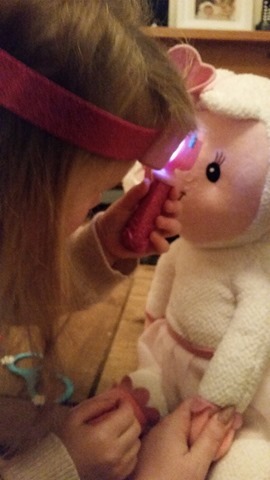 She can also fix broken and sick toys with the help of her stuffed animal friends, Lambie, Stuffy, Hallie and Chilly. 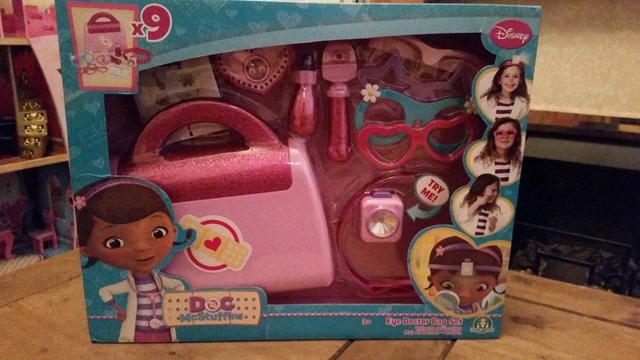 Recently we were sent the Doc McStuffins Eye Doctor Play Set to review from Flair and as you can imagine, Little Legs was thrilled. All of the contents fit inside of the pink sparkly case which is very similar to the purple doctors bag which Doc has on the series. The head torch is adjustable so it’s comfortable for your little ones to wear and is a fully functional torch with three different settings. The button to turn the torch on is quite chunky so is easy for little hands to use themselves. The glasses are bright and colourful as well as being quite pretty, Little Legs enjoyed swapping and changing the glasses for her patients to make sure they were happy with their pair. Without me having to show her, Little Legs knew what to do and what each item was for. She was delighted to be able to give her patients a very thorough eye test along with their usual health check ups. She was familiar with some of the tests after a visit to children’s A&E last summer due a particularly nasty fall on holiday so she was able to give us an explanation of what she as doing and why. All of the pieces are of the same style Purple/Pink Glitter style as other Doc McStuffins sets so can be used in conjunction with the other sets, which I really like. Combined with the other play sets in the range. Little Legs can be entertained for hours when she opens up her clinic to make her toys feel better. Like with the other Doc McStuffins sets, they are really sweet and allow children to explore their caring nature by role playing. I’ve found that trips to the Doctors are actually a lot easier now as Little Legs understands what the tools are for and it helps build her confidence. I personally think sets like these are a great idea, this one in particular for those children that require glasses. I know that some children are less than happy about keeping their glasses on so having toys like these will help. As well as that, using the tools can help children with fine motor skills and also the role playing supports emotional and cognitive development. We have a few other toys from the Doc McStuffins range now and I have always been pleased with the quality of the products. I personally think that children do not even have to be familiar with the show to get enjoyment out of these products. We were sent this item for the purpose of this review but all thoughts and opinions are our own.